Up and Social is honored to work with North Andover Haverhill Animal Hospital (NAHAH) in support of their digital marketing goals. One of our latest achievements with NAHAH is the launching of their newest website, Nahah.net. 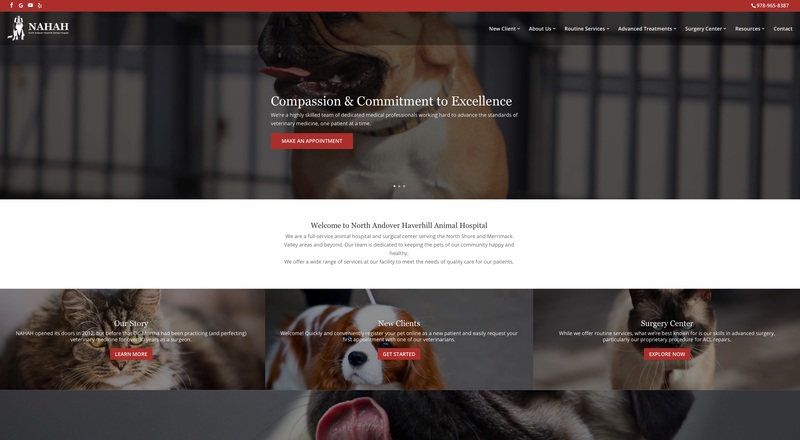 The cutting-edge look of this new website we’ve developed utilizes brilliant, eye-catching colors, heart-tugging pet photos, and a responsive design to convey their commitment to animal health, a service their furry patients thrive on. North Andover Haverhill Animal Hospital provides a number of animal health services such as wellness and vaccinations, dental care, and dermatology as well as advanced treatments such as laboratory diagnostics, digital radiography, imaging studies, ICU, and diagnostic scoping. NAHAH is directed by Dr. Thomas J. Murtha III, a Cummings School of Veterinary Medicine graduate at Tufts University in North Grafton. With Dr. Murtha’s specialty in surgery, NAHAH is able to provide a full service state-of-the-art surgery referral and wellness center with advanced diagnostic and surgical services. Surgery of any kind can be daunting for a devoted pet owner. As pet owners themselves at NAHAH they understand pet owners’ concerns for the health and happiness of their pets. NAHAH is committed to ensuring the highest quality of life for your pet and if surgery is the recommended route, rest assured that quality and precision will carry over into their surgical work. The extensive list of surgical procedures offered at NAHAH includes both routine and advanced treatments such as ear, eye, cosmetic, gastrointestinal, internal/external growths, oral, reproductive, orthopaedic, and urogenital. Technicians and doctors at NAHAH are meticulously trained to perform in order to result in the best outcome. Our goal with NAHAH was to develop an online presence that can meet today’s industry standards as well as meet their individual needs. We developed a website that is organized through a user-friendly interface that allows for easy navigation. The website seamlessly provides detailed information for both current patients and those who might be looking for health care for their pets. The website features bold images of pets that speak to their strong focus on pet health and a look and feel that conveys knowledge and advancement in the veterinary industry. tOne of the features we’re really happy about is the mobile responsive format that makes it easier for people to view their website online with a mobile device. 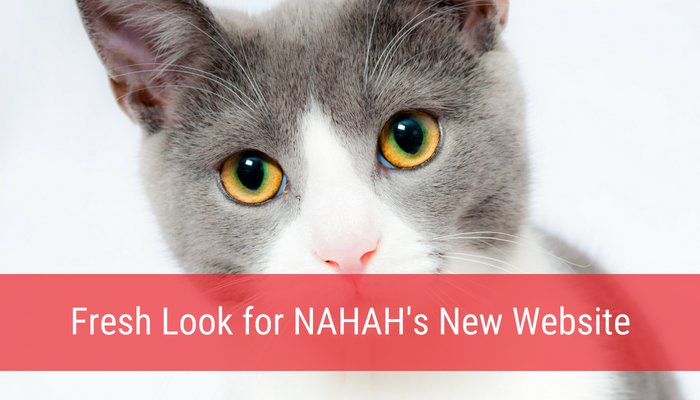 The interactive main menu at the top of the site provides users with an easy way to navigate through a wealth of information about NAHAH and how to schedule an appointment. The website provides real testimonials from clients and detailed information about services offered at the hospital. Features of the new website include a virtual tour of the hospital, patient registration, a convenient prescription/food refill section, and even a section on careers at the hospital. This new design combines simplicity and organization to offer an excellent user experience. If you are a pet owner in need of health care for your pet consider Dr. Murtha at North Andover Haverhill Animal Hospital. You won’t be disappointed.